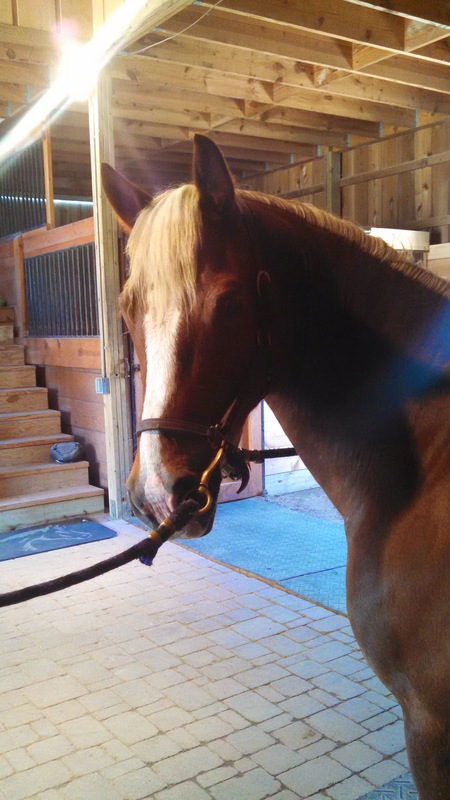 Cob Jockey: "Operant Conditioning," or, I caught my horse! "Operant Conditioning," or, I caught my horse! I caught Connor like a normal horse today! First time in two years! And in a big field! Bad Eventer recently inspired me to try clicker training. She basically said, when all the desensitization/familiarization/obedience in the world didn't help her crazy Baby Seabiscuit, she tried operant conditioning, aka clicker training, and it worked. And I thought, "Hmm...all the desensitization in the world and Connor is still spooky with stupid things, like his owner walking up to him in the field. That's a good theory." It was not an avenue I would normally consider for training, but it worked for Bad Eventer when all else failed, so I gave it a shot. Step 1: New rule: Connor only gets treats if he does something clickable. Step 2: Connor learns the command "Connor, touch!" means that he should touch his nose to the treat jar lid that I hold in front of him, and that he gets a click/treat when he does it right. Step 3: We do a couple of touch target sessions in his stall, and then in his field after I turn him out after a ride, when he is totally not spooky about me being around him, unlike before the ride. Then today, I get to the barn and he and his buddy are in a far pasture, while the two super easy keepers are in their drylot. Since that situation looks permanent, I decided it was time to set new ground rules for the new field. He was at the far end of his field, and I walked out about 15 feet from the gate and called his name. When he raised his head in response, I clicked. I said, "Connor, come on!" and when he started walking toward me, I clicked immediately to mark the good behavior. He ended up walking about 75 feet toward me, stopping once or twice to consider his options. When he stopped, I repeated "Connor, come on!" and when he started walking, I clicked again. When he finally was close enough to reach out and touch the target, he was reactive and spooky, and started at the clicker once, but didn't run away. We played the touch-click-treat game for a minute, and then I was able to halter him. Just like a normal horse. For the first time in 2.5 years. I seriously hope that was not a fluke. Congrats on the success! I hope it sticks! Sweeeeet!!! A fellow barn friend of mine had a similar problem catching her horse in the field (don't think he was quite as bad as Connor but will still turn and run from her). She started using clicker training and now catches him with no problems! That makes me feel better that it will stick! :) Always nice to see you around, I miss your blog!! I am very cautiously hopeful! That's awesome! Not sure if I said this before (probably have) but the touch command is a great one and works really well for Shy. Yay for you and Connor! You might have, but I didn't remember that you did that with her. That's cool! He is not very good at it - he'll look around and get distracted for a minute before deciding to touch it. Did it take Shy a while to get good at it? Yay! That is really awesome! Wonderful! I bet it's going to work! My girl has to come to me as well, otherwise it's not happening. I might try clicker training too - seems like it might be a bit more efficient than me wandering around pretending not to be interested in her! It might be. I did catch him again today, but he didn't walk up to me. This will be a long term experiment! Thanks! Took a little longer today, and he walked away from me, but I had his favorite treat on me, so hopefully it continues to work. I think it's substituting a new game for his usual game. I am totally interested in hearing about the ups and downs if you care to share. I've done this with dogs, but horses are a whole other thing. I think it takes something like 100 correct repetitions for a horse to become an 'expert' at something and truly form a connection between what he does and getting a reward... so sometimes he will act like he 'forgot' what the clicker means, even after he's done it perfectly a few times. Keep at it, and he'll get really solid with it. Too funny...I just ordered a clicker for my new baby horse...hoping to have some success also! Awesome! Definitely share your stories with it, I feel like I'm still learning it as a technique and I'm interested in how it works for others. Fancy Pony is getting more and more consistent - AND! I can use it with Cricket, too! She is getting braver and now wats to investigate the scary things!! Glad you found something that works. :-) here's to continued success.